It's 1894 on New York's Lower East Side. Irish cop Tom McGlory and Italian immigrant Vita Caputo fall in love despite their different upbringings. Vita goes from sweatshop laborer to respected bank clerk to reformer, helping elect a mayor to beat the Tammany machine. While Tom works undercover to help Ted Roosevelt purge police corruption, Vita's father arranges a marriage between her and a man she despises. When Tom’s cousin is murdered, Vita’s father and brother languish in jail, charged with the crime. Can Vita and Tom’s love survive poverty, hatred, and corruption? 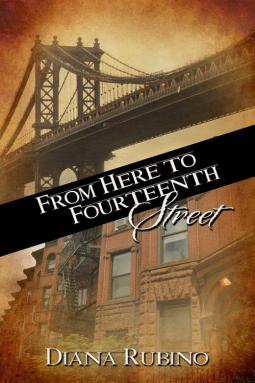 “From Here To Fourteenth Street,” by Diana Rubino is an epic love story set in New York City at the turn of the century during a time of distrust and change. Vita Caputo is a strong willed woman who wants to better herself and the people around her, but she fears her dreams may be derailed after she is fired from her job because of a misunderstanding caused by a well-intentioned police officer, Tom Mc Glory. Tom has dedicated himself to the law and when he unintentionally gets Vita fired he facilitates a new position that allows her to achieve her dreams faster. Tom and Vita find themselves falling in love, but when Tom’s cousin is murdered and Vita’s father and brother are accused of the crime, their love is tested. The two work together to find the true culprit while deepening their bond and they realize that they belong to each other for eternity. This novel is well written while offering insight a turbulent time in our country’s history. I was given this novel to read in return for an honest review.